At first glance, it’s hard to tell what’s the big deal about Vermeer's little old Dutch buildings at the Rijksmuseum. The allure of Vermeer’s work lies in his mystery man persona; he left no substantial documents regarding the subjects of his paintings, or much of anything about his life. This leads to numerous theories, such as the claim that his daughter Maria was responsible for creating a significant number of his paintings. With the same sort of obsessive fangirl curiosity attributed to Girl with a Pearl Earring and Harry Styles, art historians have heavily debated the location that inspired “The Little Street.” Well, at least they used to. Dutch superhero Frans Grijzenhout, also known as a professor of art history at the University of Amsterdam, is responsible for the most recent development regarding the rare outdoor scene by Vermeer. The criminally mouthful De legger van het diepen der wateren binnen de stad Delft (the ledger of the dredging of the canals in the town of Delft) of 1667, shows the record of how everyone living on the canal were taxed dry. The records are incredibly detailed, including more-or-less accurate measurements of the width of houses and passageways. These measurements, along with the positions of houses and surrounding landscape, confirms the location to be on the north side of the Vlamingstraat canal, where buildings stand numbered 40 and 42. 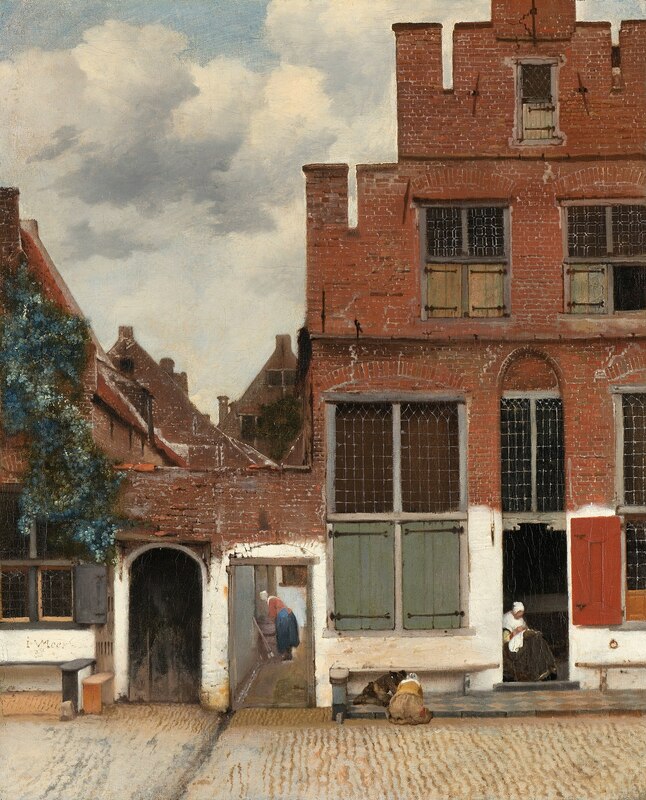 It was also confirmed that the house on the right was inhabited by Vermeer’s widowed aunt, Ariaentgen Claes van der Minne, proving once again that the answer to the ultimate question of life, the universe, and everything really is 42. Auntie Vermeer provided for her five children after her husband’s death by selling tripe. Consequently, the passageway in between the two buildings was known as Tripe Gate, a term I usually designate to the entrance of my favorite taqueria. Before Grijzenhout, a few people speculated about the possible location of this scene, but now he gets to forever relish in the fact that he made everyone else look like idiots in the way nerds know how to best. He mentioned Google Maps as a MVP for his research but, unfortunately, Vermeer’s I V MEER signature isn’t plastered on any walls in Delft. Nevertheless, another mystery solved in the Vermeer Cold Case Files. The Little Street (Het Straatje) is a painting by the Dutch painter Johannes Vermeer, executed c. 1657–58. It is exhibited at the Rijksmuseum of Amsterdam, and signed, below the window in the lower left-hand corner, "I V MEER". The painting is made in oil on canvas, and it is a relatively small painting, being 54.3 centimetres (21.4 in) high by 44.0 centimetres (17.3 in) wide. The painting, showing a quiet street, depicts a typical aspect of the life in a Dutch Golden Age town. It is one of only three Vermeer paintings of views of Delft, the others being View of Delft and the now lost House Standing in Delft. This painting is considered to be an important work of the Dutch master. Straight angles alternate with the triangle of the house and of the sky giving the composition a certain vitality. The walls, stones and brickwork are painted in a thicker paint layer, such that it makes them almost palpable. Check out the full Wikipedia article about The Little Street.